An incident allegedly involving Joey Barton leaving a rival manager with "blood pouring from his face" is being investigated by police. The Fleetwood boss clashed with Barnsley head coach Daniel Stendel in the tunnel after Saturday's 4-2 League One defeat at Oakwell, according to Barnsley player Cauley Woodrow. He claimed on Twitter that Stendel had been "physically assaulted" and left with "blood pouring from his face". On Monday, South Yorkshire Police issued a new statement, saying: "South Yorkshire Police is continuing to investigate reports of an assault at Barnsley Football Club on the afternoon of Saturday 13 April. "No arrests have been made at this time and enquiries remain ongoing.."
Barnsley said they "could confirm there was an alleged incident" and the club was "assisting the police with its enquiries". Fleetwood said they had "been made aware of an alleged incident" and were "currently establishing the facts" but neither they nor Barton had been contacted by police. BBC Radio Sheffield reported on Sunday that Stendel was "OK", but had "suffered facial injuries". English Football League chief executive Shaun Harvey said he was "stunned" to hear about the incident, adding: "While everything is alleged, a very unseemly incident would appear to have taken place and it needs to be dealt with swiftly and properly." Harvey told BBC Radio 5 Live's Sportsweek: "As an off-the-field matter, the tunnel is still in the domain of the referee but we will work closely with everybody to ensure it's not a case of who deals with the matter but actually the matter is dealt with properly. "We have all heard of tunnel fracas as players have left the pitch. It's the first instance I've heard - described as it has been - by those who witnessed it. "It's disappointing. It comes on the back of a number of challenges which have come to the surface for football to deal with. We need everyone who plays a part to lead by example." No-one from either club carried out the usual media interviews following the match, which saw Fleetwood's Harry Souttar sent off after 65 minutes with Barnsley leading 2-1. Sky Sports News showed footage of Barton attempting to leave the ground after the game but the car in which he was a passenger could be seen temporarily halted by police, before being allowed to proceed. Barton later rejoined the rest of his team for the journey back to Fleetwood. The Football Association is aware of the incident and will wait for the referee's report before investigating. 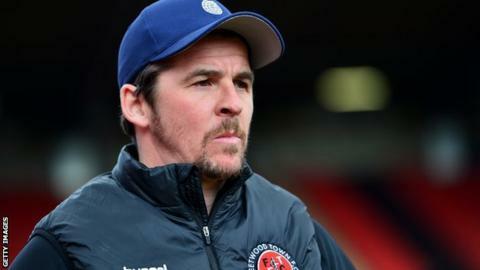 Barton, 36, took over at Fleetwood for his first managerial job last summer - one day after an 18-month Football Association ban for betting ended. He was found to have placed 1,260 bets on matches over 10 years and admitted he was "addicted to gambling". His ban was later reduced by five months on appeal. In 2004 he was fined for stubbing a cigar out in the eye of young team-mate Jamie Tandy at Manchester City's Christmas party. Tandy later sued Barton and won £65,000 in damages. He has also courted controversy during his 10 months at Fleetwood. In January he was given a £2,000 fine and a two-week touchline ban after criticising officials following his side's defeat by Bristol Rovers.